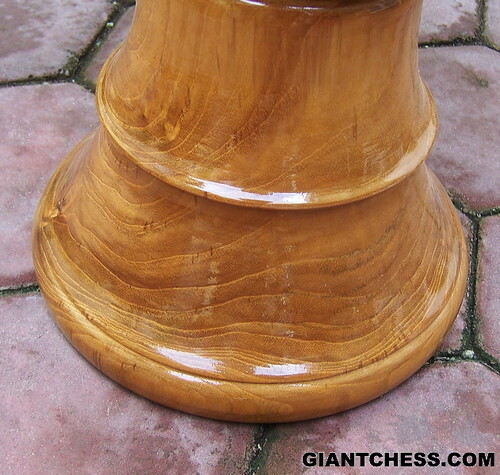 This is one part of giant chess piece that has made of Teak wood. This bottom part of giant chess must strong to hold its body. So that it carved carefully and has more big size than its body. Teak wood has known as the strongest wood in the world. So that any kind of furniture product that has made of Teak wood are very popular and worthly. Many people like to choose some furniture that made of Teak wood. Because of that reason, we choose the Teak wood as our main material for our giant chess product. The result is the strong and durable giant chess. Perfect for outdoor use. So you can decor your patio and garden are by this kind of giant chess. Durable in any seasons and weathers.